Yesterday the Kia Oval saw the launch of a world record attempt on the highest ever game of cricket, up Mt Kilimanjaro in Africa, with teams to be captained by two Ashes winners: Ashley “King of Spain” Giles MBE – member of the legendary 2005 Ashes-winning England squad and Heather Knight, current England cricketer and Ashes winner. At 5,785m this will be over 600m higher than the current world record set in 2009. Two teams will be raising money for Cancer Research UK, Tusk and the Rwanda Cricket Stadium Foundation, with a target of £500,000. Heather and Ashley will be joined by other cricketing greats, including Clare Connor OBE – former England cricket captain, 2005 Ashes winner and now head of England women’s cricket and former South African cricketer Makhaya Ntini. Enthusiastic amateurs will make up the rest of the two teams, headed up by David Harper, who came up with the idea for the whole event in classic British fashion – down the pub. David said: “As I passed 40 it dawned on me the only way I was ever going to play cricket at the highest level was if I took a game to the top of a mountain. Heather said: “I’m extremely excited to be involved in Mt Kili Madness. It’s set to be a very challenging, but amazing opportunity to raise some money for three great charities. All donations will go directly to the charities and all costs associated with this event will be met by the players themselves or by corporate sponsors. The team are still searching for sponsors in addition to those who have been generous enough to sign up. This will be the charity event of the cricketing year and will raise the attention of media and the public alike. More people have been into space, or sailed single-handedly around the world without stopping than have managed to play a competitive game of cricket above 5,100m. For interview and sponsorship opportunities, please contact David or Matt, details below. Donations to: PLEASE INCLUDE IN COVERAGE – http://uk.virginmoneygiving.com/team/MtKiliMadness. David Harper is one of the leading hotel real estate consultants in the world, having been involved in projects in over 136 countries. He is also an avid cricket fan, watching England all over the world, and playing on six continents. David has personal experience of cancer, having lost both his father and his mentor to the disease. He has organised many events for Cancer Research including jumping out of an aeroplane, cycling to Amsterdam from London, bungy jumping off Victoria Falls, taking part in the Clipper Round the World Yacht Race and abseiling off Twickenham stadium. 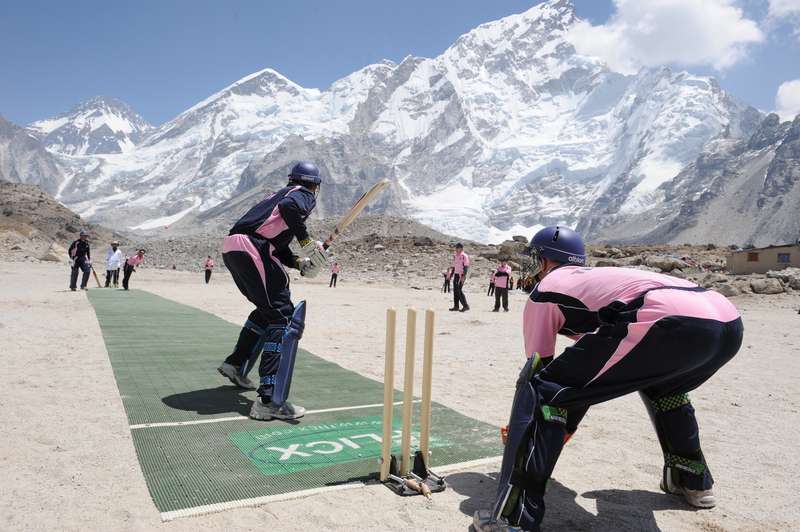 This entry was posted in 2G Flicx Pitch, Charity, Cricket, ICC and tagged 2G Flicx Pitch, Clare Connor, David Harper, Heather Knight, Kia Oval, Mt Kili Madness, World Record, Worlds highest Cricket Game. Bookmark the permalink.